I had a major book nerd moment at the bookstore a few days ago. A kind of moment only rivaled by those observed at trekkie conventions or Comic Con. A nerd moment probably comical to others to watch, but very profound to me. First, let's back up. When I was in the seventh grade, I was assigned to read a short story by Ray Bradbury entitled, "All Summer in a Day." It is a short piece of sci-fi gold, filled with alienation, depression, and a particular brand of unabashed human cruelty only found in children. It was the first "dark" story I ever read, and it was the first story to ever move me. It shocked and bewildered me. It didn't have a happy ending. In fact, it had a very ambiguous ending. The story haunted me. It was so powerful to me that I thought about it quite often over the years, and then, come Junior year of my undergrad, I had one beautiful, golden opportunity to really discuss it and explore my feelings about it. For a time, I thought I wanted to be an English teacher, so I took education classes. One fateful semester (to put it lightly), I realized teaching was not for me, but I wanted to go out on a high note before switching my major to pure and unadulterated English Literature. In the best and most enlightening class I've ever taken in my young life, taught by my mentor and teaching idol, I was instructed to create a lesson formed around a theme relevant to myself and my students. I thought carefully, and I knew I had to use Bradbury's "All Summer in a Day." My theme was alienation, and the final lesson I ever taught was a huge success of EPIC proportions. I'm not just tooting my own horn, people-- my lesson was unanimously hailed as genius by students and professor alike. That moment was and still is the shining capstone of all of my student career, and I look back on that blaze of glory with pride. Anywho, where was I? Oh yes. Ever since first reading the story, I've been looking for the book of short stories it was published in: A Medicine for Melancholy. Even the name of the collection is sheer brilliance, don't you think? The only problem: it was long out of print, and I couldn't find a reasonable and affordable way to obtain it-- that is, until a few days ago at my favorite used bookstore (which has now earned even more of my adoration, obviously). I was just leisurely browsing the "B" shelves, looking for nothing in particular, when ah-- what's that? An old collection of short stories by Ray Bradbury? Hmm... never heard of the title, but let's crack it open and see. Hold up. Wait a minute. Is it...? It is! SOUND THE ALARMS. This is not a drill, I repeat, THIS IS NOT A DRILL! Yes, dear readers, you guessed right-- I found A Medicine for Melancholy! But wait, it gets even better, believe it or not. 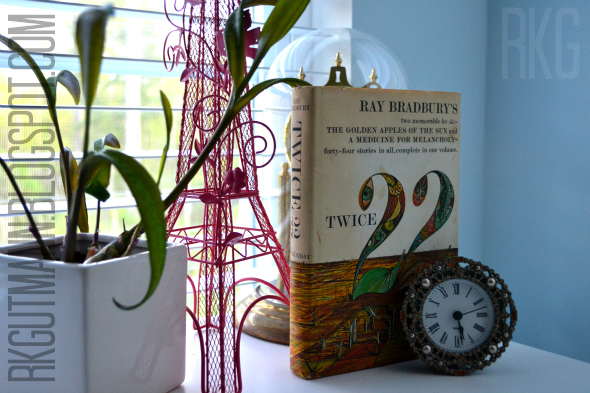 This book, entitled Twice 22, contained not one, but two collections of Bradbury's short stories: A Medicine for Melancholy and Golden Apples of the Sun. Two rare gems for --wait for it-- the grand price of six whole bucks! Yes, you heard me right, this precious jewel of literary goodness only set me back $6.00. I felt like I hit the literary lottery, y'all. Upon finding it, my reaction visibly went from curiosity, to disbelief, to awe, to pure and sweet joy, joy, joy. Picture me standing alone, clutching an old book to my breast, smiling maniacally, laughing like a madwoman, and even tearing up a bit. Sure, I looked like a crazy person, but I felt like a million dollar jackpot winner. Yes, one dusty old book had the power to make me completely and utterly lose my cool in a public place, but I didn't even care. I now possessed THE book. A book I have have idealized and coveted and dreamed about since I was literally 12 years old. It was a momentous occasion not to be tarnished by amused onlookers. Yes. I geeked out, but for good reason. I mean, just behold its beauty. The only question remains is: where in my library to set up its shrine?